Not the most photogenic... but hey, chives! Remedy: Pan-roasting allows mushrooms to release their water as they cook, eliminating sogginess and helping them firm up. Remedy: Pan-roasting accentuates mushrooms' natural meatiness, especially if you baste them with brown butter, garlic, and thyme. Remedy: Pan-roasting caramelizes mushrooms, creating an appetizing golden brown crust. 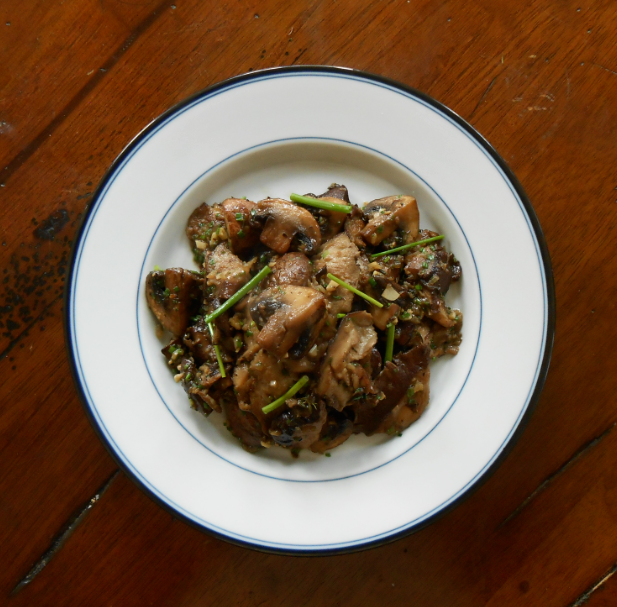 In order for pan-roasting to work, you need to remember that mushrooms contain a LOT of water. Cooking them in batches in a large pan will give them enough space for their water to evaporate so they nicely roast and don't end up boiled and mushy. It's not worth it to try to cook them all at once-- if you're in a hurry, use two pans. Stick to this method and you'll have meaty, concentrated flavor bombs that could convert all but the most committed mushroom hater. 1. To prep creminis, trim the tips of the stems off, and then quarter or halve mushrooms depending on size to make even, bite-sized pieces. To prep shiitakes, stem and cut into 1" strips (2 or 3 strips per mushroom), holding your knife at a slight angle to increase the surface area. Once the mushrooms are cut, clean them by submerging in cold water and swirling to dislodge dirt. Drain on paper towels. 2. Heat 1 tablespoon oil in skillet over medium-high. Add about a third of the mushrooms to the skillet. Season lightly with salt and pepper and pan-roast, stirring occasionally, until starting to brown, about 2 minutes. 3. Add 1/2 tablespoon butter, 1 clove crushed garlic, and a third of the thyme and reduce heat to medium. Continue to pan-roast, stirring occasionally, until evenly browned, soft, and nicely glazed from the butter, about 3 minutes. Transfer to a plate and set aside. Remove and discard garlic. 4. Wipe down skillet with paper towels. Repeat steps (2) and (3) with the remaining mushrooms. 5. Add all the mushrooms back to the pan. Reduce heat to medium-low. Add minced garlic and shallot and sauté until fragrant and translucent but not yet browned, about 30 seconds. 6. Add water and raise heat to medium-high. Bring to a boil and scrape the bottom of the skillet with a wooden spoon to deglaze. Simmer until liquid has cooked off and mushrooms are glazed, about 30 seconds. Turn off heat. Taste for seasoning; you'll probably need to add a little more salt and pepper. Stir in chives and serve immediately.